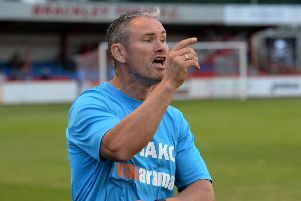 Although Mike Ford does not believe in six-pointers, the Banbury United boss is only too well aware of what is at stake on Saturday. The Puritans travel to St Neots Town who are in the bottom three in the Evo-Stik League South and a rare victory on the road will put clear water between the two clubs. 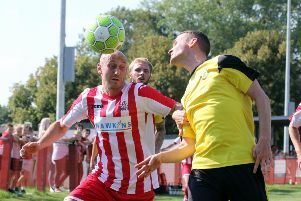 But United have not won a premier division central away game since September, and that was against basement boys Bedworth United, so Ford is taking nothing for granted. Ford said: “We’ve not set a points target, we’ve just got to take it a game at a time. But Saturday is an important one because if we can go there and win there will be 12 points between them and us. “I don’t believe in six-pointers but if we lose there will only be six points in it. We’re working tirelessly in training to get a few things right that have cost us recently. “I don’t care who we’re playing we have to adopt an approach of being difficult to beat away from home. We haven’t won away since September so there is no way we can go to St Neots and simply expect to win just because they’re in the bottom three. Charlie Hawtin is expected to be back but Edmund Hottor serves the final match of his four-game suspension.